As one of the six winners of this year’s prestigious Goldman Environmental Prize, his story is garnering attention, and very well might help save him. Growing up in the Democratic Republic of Congo, the 41-year native was a child soldier at 14, before his mother managed to help him escape to go to college. He earned a master’s degree, and ended up getting a job as a central sector warden at the park in 2003. “I always knew I wanted to help the wildlife and natural beauty I grew up around,” says Katembo. Unfortunately, he started in the midst of extreme political instability and civil war that led to numerous militias operating inside the park, often engaging in illegal poaching and resource trading. 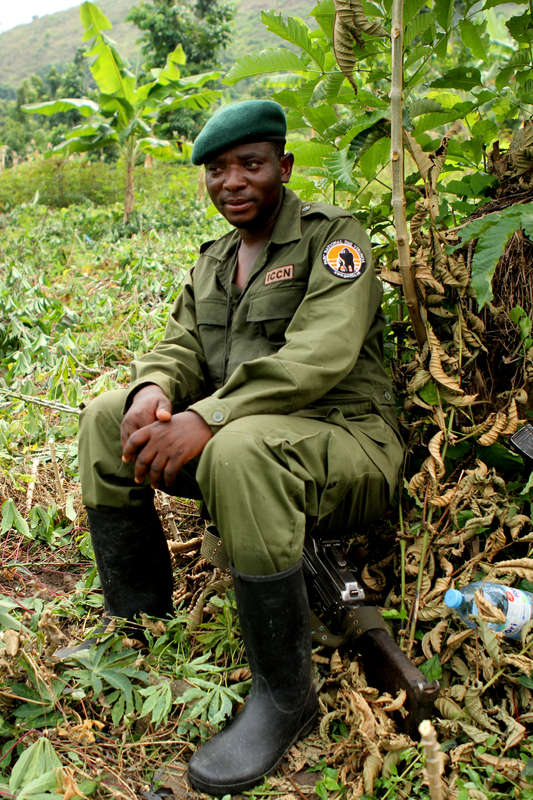 A byproduct of the chaos was the death of over 160 Virunga rangers, killed trying to protect the park. As Katembo and his team worked with the surrounding communities to save Virunga — a UNESCO World Heritage Site and one of the gems of the continent — another treacherous player entered the arena in 2010, oil giants SOCO International. To confront this new threat, he went undercover to film the illegal actions of the oil exploration company. “Every single person that was speaking out against SOCO’s illegal concession to drill for oil inside the park were arrested and taken away,” says Katembo. “Several of them died. We knew that we had to get proof of what was going on.” Together with his Park Director Emmanuel De Merode (who was shot and wounded in 2014 by unknown gunmen) he devised a plan where he would film SOCO agents and Congolese army officers as they bribed him to allow work to proceed. Over three-years wearing body cameras he amassed footage, all while watching the park be devastated. Mass shootings of elephants, hippos, and water buffalos would regularly occur “to devalue the park”; rare mountain gorilla habitat was damaged, and fish spawning grounds in Lake Edwards located inside the boundaries were destroyed. Finally they had enough proof and presented their case to the government, while at the same time the documentary Virunga debuted at the Tribeca Film Festival telling his story. Public outrage led to SOCO eventually pulling out of Virunga completely in 2015. But the damage had been done and Katembo had to relocate with his family to Upemba National Park in the southern DRC for his own safety. Once there he immediately began to work to rehabilitate that damaged park forcing out eight different illegal mining claims while seeing to growth in the elephant and zebra herds. His latest mission is to get the park declared a UNESCO World Heritage Site. He is planning on using the $175,000 he received for the prize to continue fighting to protect the parks he so loves. “We need the financial resources to continue to fight for the parks, this will help,” he said. “But, the large corporations have limitless resources, more help is always needed.